Put a couple of tablespoons of rubbing alcohol in the ziplock bag. (Use about a tablespoon for 2 cups of rice or pasta.) Add a few drops of food coloring. Add the uncooked pasta or rice, zip the bag, and mix it around until the pasta or rice is colored. Take the rice or pasta out of the bag, and spread it on paper towels to dry. Once it is dry, the color will stay and not come off on your fingers. The alcohol evaporates, so what's left is non-toxic, but we don't recommend eating it! The colored rice or pasta is fun for pouring and measuring or for digging in. Hide little plastic animals in the rice, and let your child dig around for them. Name each animal as your child finds them. If you are working on colors, you can hide colored bottle tops or lids in the rice and let your child dig for them. Name the color together as he finds each lid. If you are practicing letters or numbers, spread rice out on a cookie sheet. 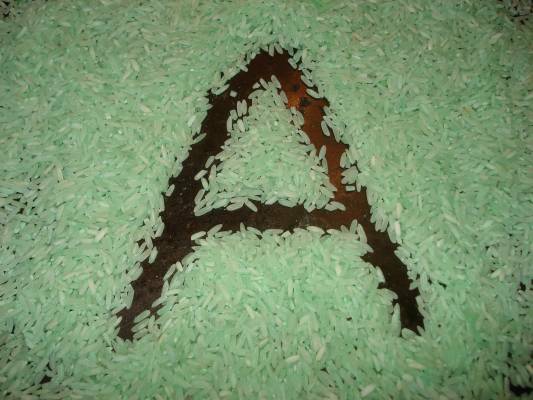 Take your child's hand and write the letter in the rice with his finger. The tactile element will help your child learn and remember. Colored rice or pasta is also great for art projects. Use glue and stick the pasta or rice to cardboard to make pictures. Be creative! This is a versatile material with many possibilities.